‘Attitude’ looms large in any discussion of executive compensation. Yet here is a book that restricts its remit to what can actually be discovered about the corporate and contractual facts, figures, and rationales that determine how much a company director ‘earns’ in an increasingly complex system of executive remuneration that seems to be taking root worldwide. In a remarkably insightful collection of articles, legal scholars from ten different countries address the state of the art of executive service contracts in twelve different jurisdictions, as diverse as (on the one hand) the European Union, its central Member States and the United States, and (on the other) Iceland and Romania. Their analysis penetrates beyond the often vague regulatory framework to actual survey figures, consultants’ reports, and even data from a number of specific firms. In summary, this incomparable book provides the most thorough (diminished only by the subject’s pervasive lack of transparency) legal analysis of this extremely topical subject. 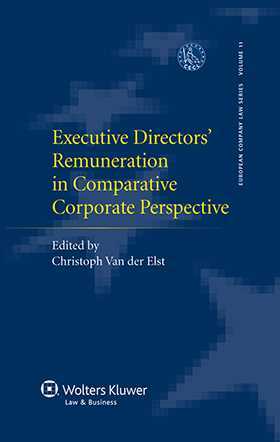 Not only in its comparative method, but also in its wealth of specific detail on determinants of executive remuneration, it will recommend itself immeasurably to interested policymakers and academics worldwide.